This week, my children's favourite Crayola impersonators The Wiggles came and played two shows in Palmerston North, thus ignoring ageing curmudgeon John Cleese's advice that the city is only a place to tour if you are contemplating committing suicide, or trying to pay off your fifth divorce (please don't let this be so, Emma and Lachy, we at least need you to breed some sort of hybrid Warm Grey Wiggle first). Unfortunately, having a job and a further 107 Pokèmon to catch, I was unable to make the gig, so am unable to rate the performance of such classics as the ode to conspiracy theories Wake Up Sheeple!, and Labour Party campaign jingle Big Red Car. The concert was in October. October. It was in a room with a biiiig curtain. The curtain was, like, yellowey orangey collour. The best bit was when Captain Feathersword falled over. It went BEEEP and then he fell over like this. And then he made Anthony fall over like this, mmmmhp, and then he fell over. But they didn't all fall over. Just Captain Feathersword and Anthony fell over. Emma and Wags and a teddy bear were there too. They danced. And I gave Anthony a bone, and Anthony put my bone in his bag. It wasn't a real bone, it was a cardboard bone. Then he didn't do a song about it. Wags didn't have it first, but he's probably eating it now. 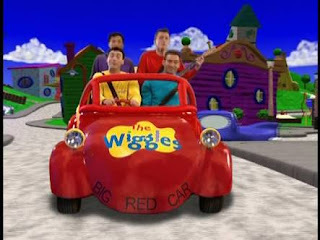 It's probably time for The Wiggles to go to bed. 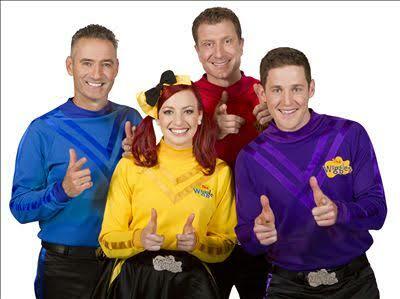 The Brown Wiggle wasn't there. What is the Brown Wiggle called? Why are Emma and Lachy in love? Emily liked the concert, and even she danced, but then she rolled over and she cried. I didn't dance, cos I refused to dance. They singed Rock-a-bye Teddy Bear. It was a good song. The best song was Here Comes Simon, it was really funny. They didn't have the big red car. It was probably broken and needed fixing at a garage. They had an animal car. They did sing about Fruit Salad, but there were different rhymes from a different song in it, which isn't actually fruit salad. I think i would like to go to a ADCC Thunderstruck concert.